Now TV is set to get a lot bigger very soon. The platform, which began as a comprehensive streaming service offering live and on-demand access to Sky's libraries, will soon be expanding to encompass a full triple-play package of broadband and phone services, as well as offering Freeview's 60 free-to-air channels through a new Now TV Smart Box. Here's everything you need to know about how the new Now TV. The biggest change to Now TV as a service is the addition of a contract-free triple play option. Alongside the existing Now TV streaming passes you'll also be able to purchase fixed line and broadband packages. They're not quite as flexible as the streaming packages - you won't be buying a day pass for broadband like you can for the sports pass for example - but it's nevertheless much better than many of Sky's broadband competitors. It's important to note that with Now TV Combo Sky is continuing the industry's proud tradition of not including its £17.99 a month line rental in its headline prices, which start at £9.99. Three speeds of broadband are available (17/38/76Mbps) and there are also three phone packages covering free weekend/evening calls, free anytime calls, or a simple pay as you go option with no included calls. Like the original Now TV, Combo is completely free from any form of contract, meaning you can cancel at any time without penalty. Streaming services are offered on daily, weekly, and monthly plans, and the accompanying broadband and phone packages are available on a monthly basis. Its triple-play offering might not be the cheapest around, but this flexibility might just end up being Now TV Combo's silver bullet, and could prove very attractive for anyone who needs to be connected for just a small number of months. On the resolution side, Now TV's new Smart Box is limited to 720p rather than the 1080p of Sky Q or the increasingly-industry-standard 4K Ultra HD. The reason given for this was a desire to keep the £40 box as affordable as possible, but my speculation is that part of this decision was to avoid creating competition with Sky's more premium Sky Q option. A big change to the new Now TV Smart box is addition of 60 free-to-air channels from a built-in Freeview tuner. Now TV has always included a selection of 35 of Sky's premium channels depending on which passes you subscribe to out of cinema, entertainment, kids and sports. But the change here is that these Freeview channels will come through a traditional aerial rather than being streamed. Additionally the Smart box allows for these live channels to be paused and rewound, but not recorded. This is a large increase in the amount of content available to watch on your Now TV Smart box, but it should also be noted that the original Now TV box will continue to be available as a more budget option. While the number of channels available on the new Smart box having increased by so much it's a shame to see that the two biggest streaming services, Netflix and Amazon Prime, continue to be absent from the service. 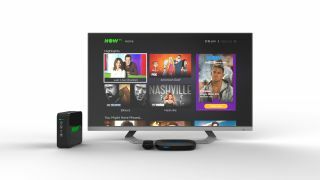 It's a shame, because the new Now TV Smart Box was so close to being the only box you need to plug into your TV, but if you want to watch the likes of Netflix-exclusive Daredevil or Amazon Prime's Preacher then you'll need to have a second streaming device. But why the omission? When I asked Sky directly its answer was about requiring a commercial relationship with any providers on its service, but with such streaming services competing directly with Now TV's own streaming selection their omission isn't exactly surprising. Sky's Now TV Smart Box and Now TV Combo might be adding a great deal to the lineup, but the core Now TV service and Now TV box continue to be available for anyone that wants a flexible streaming service and low cost streaming box respectively. But you can also mix-and-match between the new services. You might steer clear of any triple-play bundle but still purchase the new Smart box as a standalone for example. So Sky's core proposition remains based around choice. You might pay more for the benefit of having the short-term contract or the mix and match access to streaming passes, but ultimately you have exact control over what you pay for.